What Are My Options If a House Inspector Finds That the Roof Is Bad? Gutters frequently fill with leaves and other materials, especially in the autumn. It is important to effectively clean the gutters, not only for the integrity of your roof, but to maintain adequate water drainage. Gutter cleaning that requires 40 foot ladders and a spotter will cost more. While in theory it may be cheaper for you to do your own gutter cleaning, there are numerous reasons why hiring a professional service might be a wise choice. Since a good portion of the gutter is located on the roof, doing the job yourself would require that you climb up on the roof, a dangerous task if you are not familiar with such things. Professional gutter cleaners do this kind of thing all the time, so they are properly trained to handle the dangers involved. You also should consider the time it would take to clean the gutters yourself. You may prefer to pay for a service and keep your free time to pursue your interests or even just relax. When the service provides you with a price quote for the job, it will probably look at the size of your home and the number of stories involved. It may also take into consideration the condition of your down-spouts and how much there actually is to clean. One-story homes typically cost between $75 and $225 dollars to clean. Two story homes are slightly more expensive. Prices really start to go up with three stories because a 40 foot ladder and extra person need to be added to the job, costing an extra hundred dollars or so. Really clogged down-spouts are labor intensive and may run an extra $400 - $500. 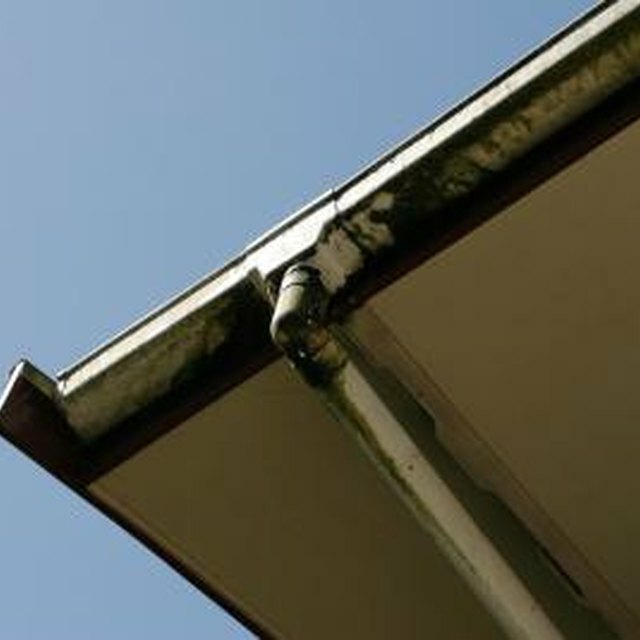 Get an estimate for the gutter cleaning service before you commit. You may find another qualified provider that costs less, especially if you show it the quote the first service provided. Second, some services will give you discounts for repeat business, so if you find a service you like, consider using it again in the future. Geoffrey St. Marie began writing professionally in 2010, with his work focusing on topics in history, culture, politics and society. He received his Bachelor of Arts in European history from Central Connecticut State University and his Master of Arts in modern European history from Brown University. How Often Should You Re-Roof Your Home? Is Duct Cleaning a Scam? How Much Will it Cost to Fix My Roof? Is Home Duct Cleaning Worth It? What Can I Use for Snow Melting & Cleaning a Flat Roof?